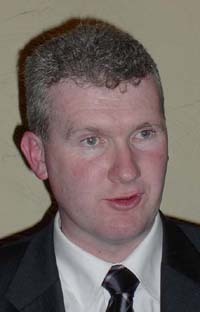 Tony Burke — Anthony Stephen (Tony) Burke (born on Nov. 4, 1969) is an Australian politician representing the Labor Party. He was elected as a member of the Parliament of New South Wales in 2003 and in October 2004 was elected to the federal House of Representatives as the Member for Watson, New South Wales. New Governments have recently taken office in Australia and South Korea. Their initial engagement on key issues will shape their bilateral relationship well into the future. South Korea is one of Australia's most important markets for agricultural products. What are the priorities of the new government for Australia's agricultural sector and for developing the agricultural trading relationship with South Korea, including Australia's aspirations for a comprehensive Free Trade Agreement between the two countries? Our guest, Tony Burke, Minister for Agriculture, Fisheries and Forestry, will be at the forefront as the Rudd government addresses these issues and will share with us his perspectives of the road ahead. — strengthening relationships with counterpart ministers and farmer organisations involved in formulating agriculture trade policy. "The focus on bilateral agricultural relationships, encourage trade in portfolio products and help address trade impediments." The Honourable Tony Burke was appointed the Minister for Agriculture, Forestry and Fisheries by Prime Minister Kevin Rudd in December 2007, when Labor was elected to Federal Government. Mr. Burke was formerly the Shadow Minister for Immigration, Integration and Citizenship, and prior to that, Shadow Minister for Small Business. For more information please refer to Tony's one page bio located on the website, www.anzcck.org. NB: Cancellation of reservations must be made by 12 p.m. Wednesday 9th April to avoid receiving an invoice for the event, as we need to guarantee minimum numbers to the hotel.